Christmas and chocolate go hand in hand. This festive season whether you like your chocolate dark, boozy, milk, caramel, fruity, minty, nutty or white the folks at Hotel Chocolat have something to suit one and all. If you can't make up your mind what to buy from their huge selection help is at hand with their 'Have yourself A Merry Little Christmas' Hamper (£25) Ribbon tied and full of festive goodies comprising of Clementine Baby Bombes, 40% Milk Snowflakes, Rocky Road Slab, Comet Does Caramel Slab, Christmas Pocket Selection, Salted Caramel Nano Slab and Fruit & Nut Nano Slab. Their Rare and Vintage Festive Wreath (£8) would make the perfect stocking filler. 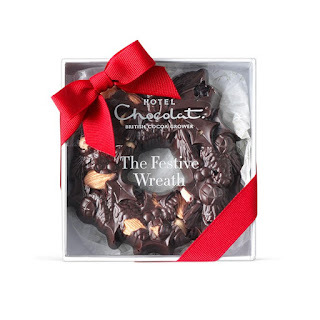 The chunky, munchy wreath is fully loaded with premium Piedmont hazelnuts, almonds and ruby cranberries. 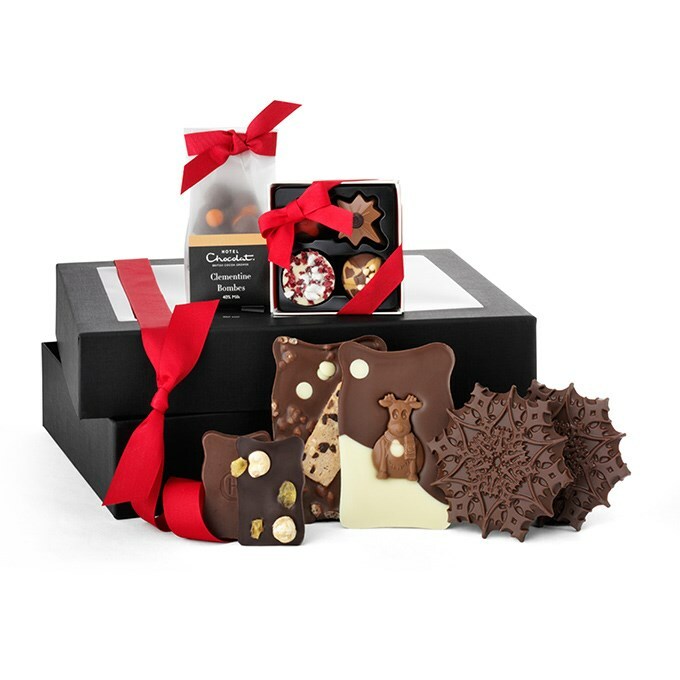 Check out their full range of Luxury Chocolate Gifts and get a head start on your Christmas shopping. 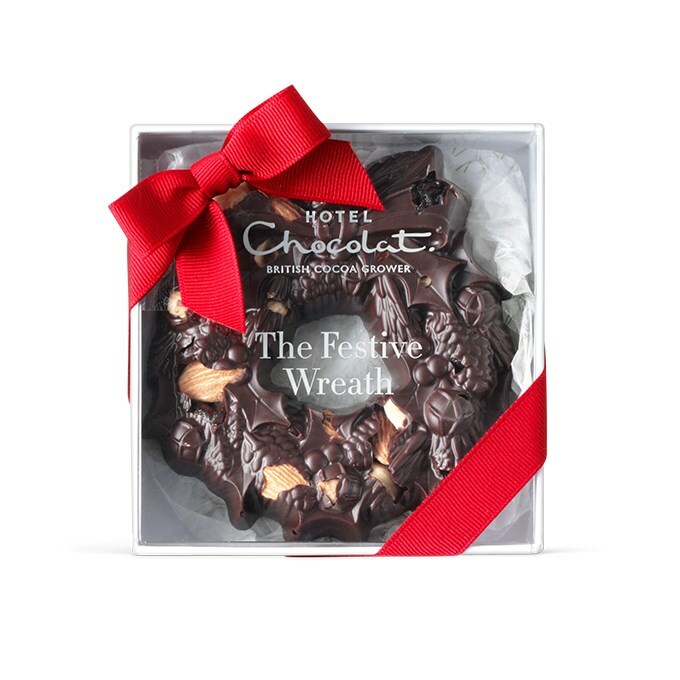 Hotel Chocolat have provided a Merry Little Christmas Hamper and a Rare and Vintage Festive Wreath as a giveaway for readers of Foodie Quine. Prize value is £33. Entry is via the Rafflecopter widget below. To enter, let me know in a comment "What's your favourite Christmas Chocolate treat?" For additional bonus entries you can follow me on Twitter, Tweet about the Giveaway, follow me on Instagram or like me on Facebook. Giveaway ends 2nd December 2016 11.59pm Good Luck! Disclosure : Prize and images courtesy of Hotel Chocolat . All views expressed are my own. This is not a paid post but I have been compensated in Chocolate. A slice of Yule log served with fresh whipped cream! I love the wreath above - biscuit and cocolate! I like to make my own chocolate truffles. Chocolate with nuts ,more chocolate,with brazil nuts,more chocolate with pecans ,more chocolate with hazelnuts,more chocolate with walnuts,more chocolate with more chocolate n nuts. Terry's Chocolate Orange is my favorite chocolate! Chocolate Mints - the crispy ones! Stollen or anything else with lots of marzipan! My favourite hass to be the homemade Pudini my mother and I make. They are a mini christmas pudding made from christmas pudding, chocolate and alcohol, and decorated with white chocolate and red and green glace cherries cut to look like holly. They make a great gift or party option! Definitely Yule Log! Cannot resit it!! Yule Log and cream - yummy! My favourite is Yule log with lots of thick cream! Dark chocolate covered marzipan - I'm attempting to make my own marzipan truffles this year! Yule log and squirts cream....delicious! Lindor and Forerro are my Christmas treats too!!! Who doesn't love chocolate. Yum!! Lindor chocolates for me, it's the only time of year I allow myself to indulge in them! 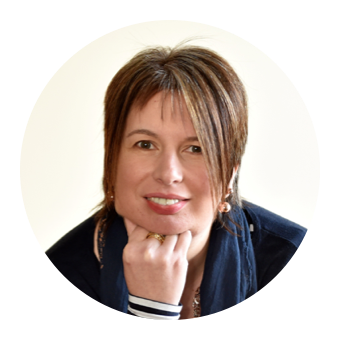 I love dark chocolate - Chocolate covered brazils, dark chocolate cake, fruit and nut - I could go on! Anything chocolate but chocolate flavoured things are definitely a no no! My favourite Christmas chocolate treat is rum truffles- the stronger the better! A slurpily delicious glass (or two!) of Baileys! we have a traditional trifle every christtmas with loads of fresh cream and flake chocolate on it! I love After Eight mints and we only have them at Christmas! I love liqueur chocolates. I only have them at Christmas. Ferrero Rocher are my favourite Christmas chocolate treat!! it will not accept entry all I get is "Aw Shucks swe didnt get your entry, please try again when trying to enter after my comment"
I love milk chocolate marzipan. Oh always apricot parfaits, whatever time of year. My favourite chocolate treat would have to be chocolate oranges. 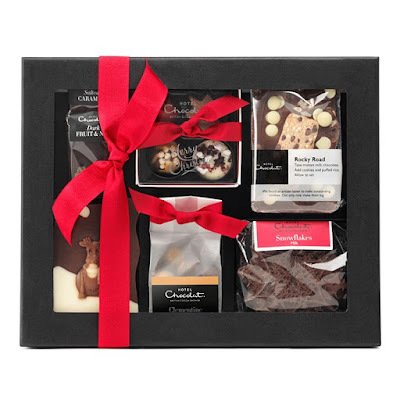 Hotel Chocolat chocolates of course but also Thorntons, Green & Blacks or Seed & Bean. Can't beat a tin of Roses, been the same every Christmas since I was a child. Any Fruit & Nut chocolate combo! Love the Hotel Chocolate caramel wreath. Ooh chocolate orange segments and mini toblerones yum! I like the cheese and the champagne. Ferreros for pud! I huge box of Lindt Lindor! LUSH. I love the brown Quality Streets but I just heard they've got rid of them! I love a nice chocolaty yule log. My favourite is a big tin of Celebrations! That's a really tough call! It has to be a Chocolate Orange, though - ever since I was a kid I've had one in my Christmas stocking, so always associate them with Christmas! Chocolate log or white chocolate coins, yummy! My advent calendar - a lovely treat every day. I love getting a chocolate panettone and a bottle of bubbly and having that for breakfast on Christmas morning! The ultimate indulgence. Yummy! Whatever's on my parents' Christmas tree that's out of reach of my nieces. yule log with brandy cream. I love mini rum truffles!